How would you compare Mass Effect to Knights of the Old Republic? I must admit that even the Codex is curious about Mass Effect, so we simply couldn't resist the urge to ask you a few questions. Please describe the game for our readers. It's 2138. As Commander Shepard of the SS Normandy, you will take your elite recon squad across a galaxy in turmoil, in a desperate race to stop the return of an enemy without mercy. To stop this enemy, you must act without remorse, without hesitation, and outside the limits of the law. Your only imperative is to preserve the safety of civilized life in the galaxy - at any cost. You must become the tip of the spear of humanity, for you alone know the full extent of what is at stake if you should fail. It's a good question. In some ways Mass Effect is a lot like Knights of the Old Republic, so all KOTOR fans should be really excited. You have a starship, and you travel the galaxy, having all these really great moments. You have all these Mass Effect powers, which are a lot like Force Powers in the Star Wars universe. However, the main difference, which is where the game really shines, is the main character. I know the word "extreme" may seem overused a bit, but it's an extreme character who does some very extreme stuff unlike Revan who was a very blank character. Tell us more about the main character, Commander Shepard, please. Commander Shepard is an N7 elite which is a member of the human military that really is among the very best of the best and he's already proven himself, so you don't have to. We've already created a fantastic and extreme character for you, so forget about developing your character - just load the game and enjoy the ride. It's a really intense experience that is of a kind of flavor that you've never had before. That's really the essence of the experience of being Commander Shepard, which is very similar to being Jack Bauer. So if you think about "24", the famous TV show that kept us on the edge of our seats for 5 years, the secret of its success and popularity is the extreme stuff that Jack constantly goes through. His character has a very specific flavor to it and that's one thing we didn't want to miss out on with Mass Effect. Both Jack and Commander Shepard are elite agents of a military outfit that's really among the best of the best, and both characters will stop at nothing and will be stopped by nothing, breaking anyone and anything. Clearly you cannot compare such a character to completely blank characters typical role-playing games offer you. What are your thoughts on role-playing games? One of the challenges in role-playing games is creating the experience of being somebody special even from the beginning, being really empowered, feeling like all throughout the game you're somebody really important and special. And you always have that kind of exciting level of intensity that you can bring to situations and it causes us to write bigger and better storylines as a result. So as you can see by recognizing, dealing, and overcoming these challenges we improve other aspects of the game as well. Say what you want, but if you're purely a good guy, then why are you fighting? Hmm, I've never thought of it this way. Good point. Bioware is known for creating simply amazing, mind-boggling stories. What does Mass Effect have in store for us? "Among those who study ancient ruins, a horrific legend is told: every 50,000 years a race of machines returns to harvest all organic civilizations. Few believe this ancient legend. Commander Shepard, however, knows it to be true. The fight to stop this extinction event has become his most important mission in the galaxy." As you can see from this snippet, Bioware employs many talented and amazingly creative writers who surprise us all every time yet another storyline is created. In Mass Effect you discover information about an ancient race of mostly evil robots that was responsible for destroying galactic civilization roughly 50,000 years ago in a horrific cycle that resembles a "harvest" of organic life - and they're about to return! This storyline creates many questions like "evil robots? ", "horrific cycle? ", "harvest of organic life? ", "return?" which, hopefully, will be answered in the third game. It makes sense that Commander Shepard is the only person who's seen this evidence - and being the only one important and special enough to do something about it - he begins scouring the galaxy to destroy the agents of the machines and prevent the cycle from happening again. The president counts on Commander Shepard as the only man he can trust to find the robots and to stop the destruction of everything we hold dear. 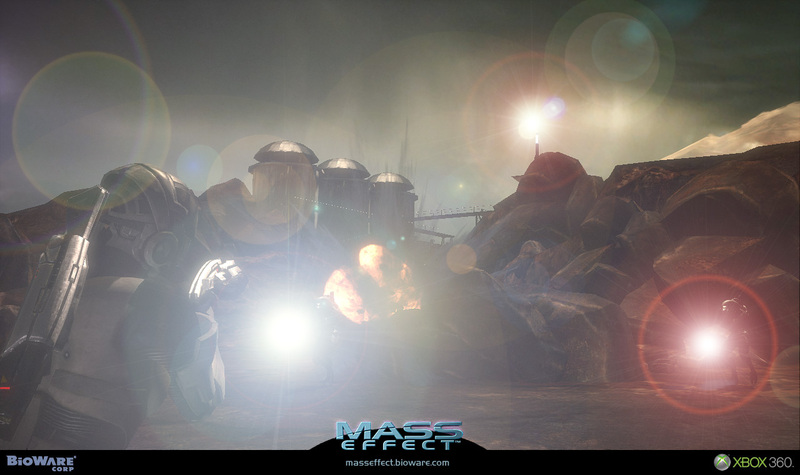 Can you explain the concept of Mass Effect Force Powers? 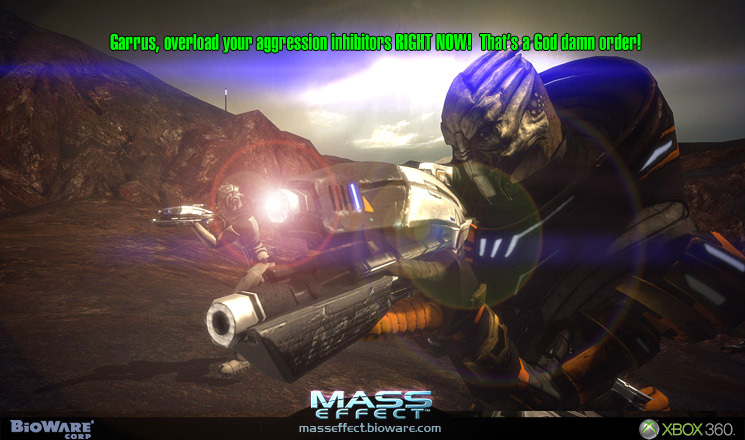 To understand Mass Effect powers you need to understand what mass effect is. Mass effect is a single newly discovered physics phenomenon similar to gravity. Some people can control the phenomenon, which is actually yet another phenomenon. These people can control and bend the laws of physics, which grants them unique powers unlike anything you see in other games or TV shows. There are two different manifestations of this physical phenomenon: light and dark. For example, the dark energy abilities: if you imagine if we were able to affect another physical force kind of like gravity, then what kinds of things would you be able to do with it? Like being able to create a small singularity that pulls everything towards it (Dark Pull) or pushes everything from it (Dark Push). You can also throw things around (Dark Throw), which is pretty cool when things in the environment start flying towards your enemies causing damage. The light energy powers are mostly supportive and used for healing and calming down. 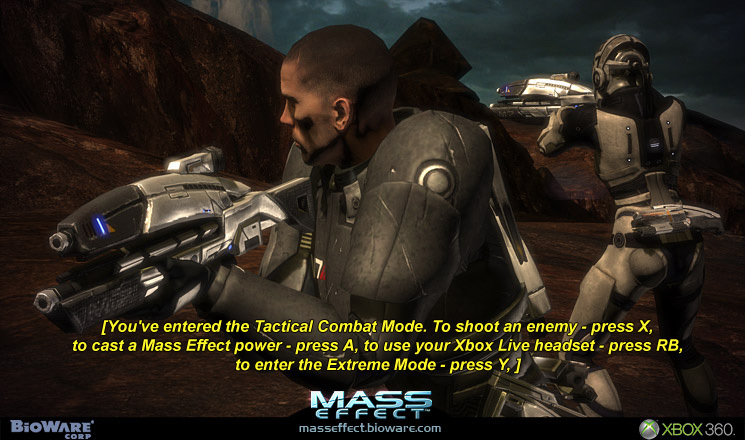 The dark powers are very extreme, of course, and Commander Shepard will be able to use them very effective. Grabbing someone's collar telekinetically always gets everyone's attention. What about dialogues? Are there any? Dialogues are one of those old conventions that we're trying to avoid. You may even say that we are redesigning RPGs and changing what they are all about and how you play them. Let's use the example I gave in the previous interview: you're running through an open area but up ahead you can see a character that looks like their purpose in life is that they will stop you and talk to you when you get close. After you play a few games like that it starts to drive you nuts because you see that character and you think, oh I'm not ready to have a conversation with that character yet. 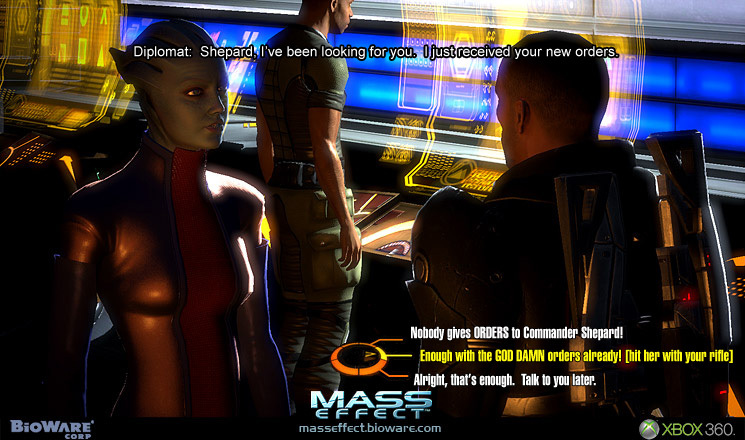 Whereas in Mass Effect, you can run past that character and they may call out to you with something that entices you to go over and talk to them. See the difference? In one case the character just stands still driving you nuts, and in another case the character will actually do something extreme to attract your attention. We'd like to thank Bioware and our new buddy Casey for making this truly amazing game.